From Northern Nevada to all corners in America - - from Macedonia and Greece, to Sweden and French Canada, this large survey-style exhibition presents sixty-six artists, including one collaboration, exploring the theme of self-portraiture. Perhaps considered just the folly of indulgent navel-gazing, the self-portrait continues to be important and interesting because it not only provides varied perspectives of the artist looking back on the self in circumstance, but rather also provides cultural, political and social insight into the time period and conditions under which the art was made. In a growing globalization, how we reflect the times we live in is subject matter that crosses the unsteady boundaries of nation, race, gender, religion, political affiliation, age, class, etc. The exhibition demonstrates that humor, pop culture, health, irony, history, intellectual debates, idealism and story-telling are ever-present undertones to how artists express themselves, whether they use self-portraiture as rare device, or as regular all-encompassing investigative tool. All media, regardless of size, are in the exhibition, including printmaking, fiber, painting, drawing, photography, animation, performance, sticker art, video, sculpture and interdisciplinary media. 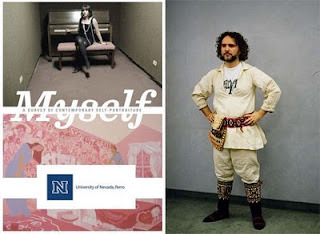 MYSELF’s 72-page catalogue is available with co-essay conversation between artist writers Joy Garnett and Mira Schor. Preface by Howard Rosenberg, University of Nevada, Reno Art Department Chair. Artist List: Funda Zeynep Ayguler, Marie Bergstedt, Megan Berner, Emma Bee Bernstein, Pam Brekas, Chris Carnel, Jean Marie Casbarian, Craig Cully, Megan Cump, Joe DeLappe, Michael Eade, Peter Emerick, Joy Episalla, Elise Gardella, Chantal Gervais, Alex Gingrow, Jennifer Graham, Cynthia Greig, Amy Guidry, Jen P. Harris, Rosi Hayes, Ahren Hertel, Aimee Hertog, Nene Humphrey, Suzanne Joelson, Josh Jordan, Jiyeon Kim, Eunkang Koh, Kate Kretz, Larry Lee and Jason Dunda, Julie Lequin, Elizabeth Leister, Teryn Loebs, Holly Lynton, Megan Malone, Valerie Margolis, Lily McElroy, Alan Mevis, Rob Millard-Mendez, Elizabeth Morisette, John Orth, Kathryn Pannepacker, Maria Paschalidou, Zoran Poposki, Robert Prichard, Clifford Pun, Letitia Quesenberry, Carol Radsprecher, Erin Riley, Ariana Page Russell, Susannah Sayler, Matthew Schlagbaum, Tim Sharman, Ebenezer Singh, Jackie Skrzynski, John Steck Jr., Joshua Stern, Robin Tewes, Kristine Thompson, Clare Thornton, Christina Renfer Vogel, Deborah Wasserman, Jessica Watson, Orion Wertz, Tammy Wofsey.